In the first three episodes, we saw Lord Ramsay killing his stepmother and baby brother, Brank Star visited his father’s past with Three Eyed Raven; Arya Stark got her eyes back, and Rickon Stark reached Winterfell. “Tyrion strikes a deal. Jorah and Daario undertake a difficult task. Jaime and Cersei try to improve their situation. You can go to HBO Go and HBO Now to watch the episode live online and to stream Game of Thrones S6 free via any web browser or computer. You just need an account over HBO sites. The synopsis doesn’t reveal too much about the episode or what fans can expect from the “Book of The Stranger.” It will air on 15th May 2016 at 9 ET on HBO. However, after watching the promo, we get enough clues to what we are going to witness next. We will get to know about Sansa’ fate, and Littlefinger will come in action once again. Lord Baelish is concerned about Sansa as her life is in a terrible situation as Ramsay is hunting for her. Moreover, it will also be clear that how the elder Stark daughter will affect him. In the trailer, it is seen that she successfully made it to the Castle Black. Former Lord Commander Jon Snow has left the Night’s Watch after punishing those who betrayed him. He has left to achieve unknown. “For me, this time out, there’s a level of atonement in relation to Sansa and my misjudgment of Ramsay Bolton. A lot of what I’m up to is atonement and really trying to align myself the right people — though, I guess, I’m always doing that! I left Sansa married to a psychopath. It’s probably the one time we’ve seen Littlefinger slip up. He really didn’t know about him. He should have,” says Aidan Gillen, who plays Littlefinger. In the meantime, the Lannisters and Tyrells are in search of a way to save Margaery Tyrell from another Walk of Shame. Earlier, Cersei Lannister had to do it. However, the High Sparrow isn’t going to stop at anything from following strict religious beliefs of the Faith of the Seven. 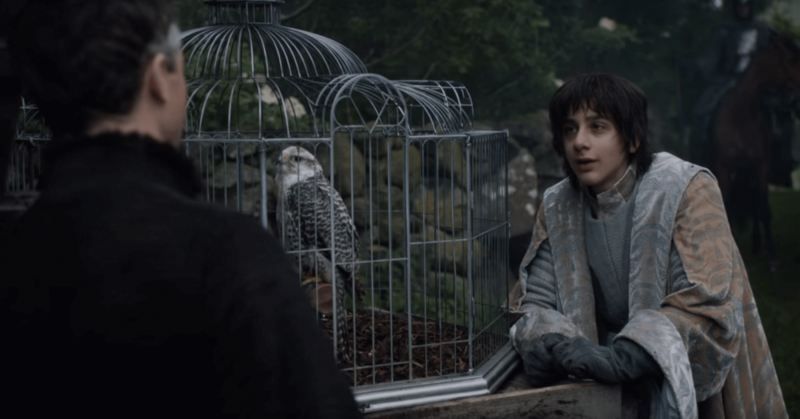 In episode three, we saw Bran revisiting the Tower of Joy in Dorne. He saw Lord Eddard Stark and Howland Reed killed Ser Arthur Dayne. Brian got emotionally attached to the crying of a baby, and he tried to go inside of the tower, but Raven stopped him and brought him to the present. The scene sparked rumors that Jon Snow might not be a Stark but a Targaryen. GOT season 6 episode 4 will air on HBO on 15 May at 9 pm in the US and 16th May at 9 pm on Sky Atlantic in the UK. I am ready to strangle Jaime for continuing as Cersei’s sheep, following her around like a puppy. Are they really not going to change this? My least favourite episode of the season, 5/10 and 4 of those points were for Tormund. ? Also….is there a reason for the man bun? No, really. Does it symbolize the new Jon? The other NW men seem to know it’s already out of style. Ned had a half-ponytail thing. But why the man bun? Is he disassociating from him hair? Distinguishing himself as not part of the Watch and seeing things more clearly without the locks in his face? Embarrassed that Mel clipped his hair in an uneven fashion? So many questions. Summary: Tyrion strikes a deal. Jorah and Daario undertake a difficult task. Jaime and Cersei try to improve their situation.